Days after a severe earthquake and tsunami affected the nuclear power reactors at the Fukushimi Dai-Ichi nuclear plant in Japan, there continue to be problems cooling the reactor cores. The reactors operating at the time of the earthquake shut down very shortly afterward. However, heat in the reactor cores continues to be a problem after shut-down. In addition to the tremendous amount of heat contained in the fuel rods when the reactors shut down, the reactor cores continue to generate heat that must be removed in order to prevent damage to the nuclear fuel caused by overheating. 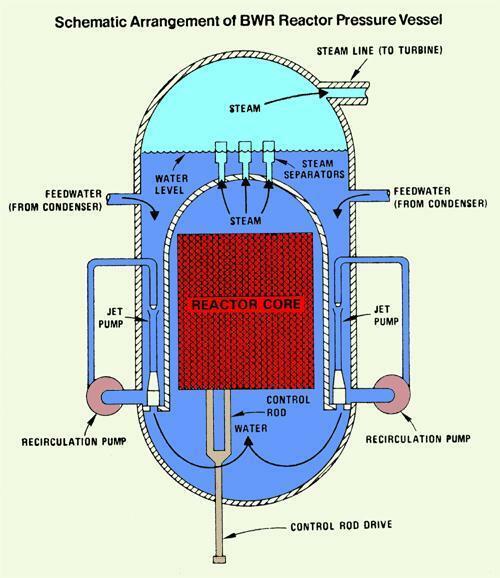 Thermal energy (heat) is produced in the reactor core of an operating reactor by the fissioning, or splitting, of uranium and plutonium atoms. When these atoms are hit by a neutron, they may split into two smaller atoms—and not always the same two types of smaller atoms—and in the process release energy and more neutrons. Many of the smaller atoms formed by this process are unstable and as a result release radioactivity in the form of gamma rays, alpha particles, or beta particles. These radioactive emissions create heat: they carry energy with them, and when they are absorbed by material around the atom, that energy heats the material up. 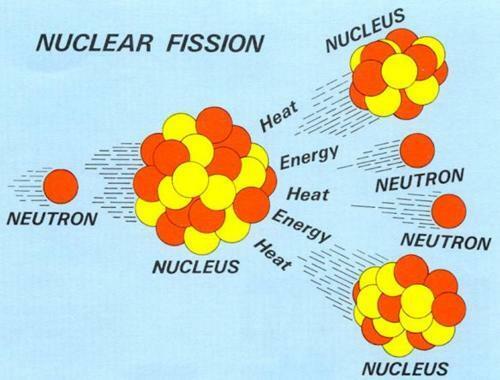 Atoms release radioactivity at different rates ranging from fractions of a second to hundreds of thousands of years. Long after a reactor has been shut down, the reactor core continues to emit radioactivity and continues to generate heat. Nuclear power plants have cooling systems designed to circulate water through the reactor core after a reactor is shut down to carry away this heat. In the Fukushima Dai-Ichi reactors, the pumps that circulate this cooling water are not working. In that case, the water sitting in the reactor vessel surrounding the core will heat up and then start to turn to steam and boil away. Emergency workers have been attempting to pump sea water into the reactors to replace the water that boils off. This additional water is needed both to help cool the reactor and to keep the fuel rods from being uncovered. Figure 2 shows the typical rate at which heat from a shut-down reactor core boils away water when the cooling systems are not functioning. The vertical axis shows the boil-off rate in gallons per minute. 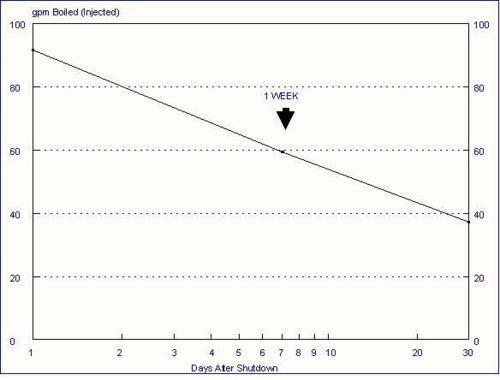 The horizontal axis shows the time, in days, since the reactor was shut down. Even a week after being shut down, the heat from a reactor core boils water at a rate of nearly 60 gallons per minute. The boil-off rate declines with time while the rate of radioactive release decreases. The reactor core resides in the lower portion of the reactor pressure vessel (see Figure 3). The normal water level inside the reactor vessel is roughly 196 inches, or 16 feet, above the top of the reactor core. The nuclear fuel is protected against damage caused by overheating as long as it remains covered with water. A rough rule of thumb is that it takes 200 gallons of water to raise or lower the level inside the reactor pressure vessel by 1 inch. For the boil-off rate of 60 gallons per minute a week after shut down, it takes around 200 seconds for the water level inside the reactor pressure vessel to drop an inch. If the reactor cooling system fails one week after the reactor was shut down with the water level inside the reactor vessel is at its normal level, it would take approximately 11 hours for boil-off to reduce the water level down to the top of the reactor core. Without cooling, the boil-off would continue to drop the water level below the top of the nuclear fuel in the reactor core. As nuclear fuel was uncovered by water, it would begin heating up. As the fuel temperature increased to 1,800°F, a chemical reaction between the metal cladding of the fuel rods and the steam flowing past would generate large quantities of hydrogen. If the heat-up continued past 2,200°F, the exposed fuel would begin to melt. This process appears to have produced the hydrogen that leaked from the reactor vessel and caused the explosions in the reactor buildings of Units 1 and 3. In addition, Japanese Electric Company officials have said they expect that some of the fuel has been uncovered long enough to have melted.